Think there’s a market for your goods or services abroad, but wonder if you’re too small to get into exporting? If responses to the 2016 Small Business Exporting Survey are representative, exporting could be easier than you think. On a scale of 1 - 10, with 10 being the most difficult, 69 percent of small exporters rank the difficulty of entering the exporting arena as a 5 or easier. Seventeen percent ranked it an easy peasy 1. The survey of 530 owners of businesses with fewer than 500 employees was conducted in February and March by the Small Business Exporters Association, the international trade arm of the National Small Business Association. Most businesses surveyed also had gross sales or revenues under $5 million, total assets under $5 million, and payroll under $1 million last year, and had been in business more than 10 years. More than half of those surveyed (58%) claimed to have sold merchandise or services to a customer outside of the U.S., and more than one-third of them said their export volumes are increasing (though, as our previous coverage noted, that’s a significant drop from the 52 percent who said so in 2013). If you think successful exporting requires that your business have an office or employees out of country, or an export broker, think again. Just 2 percent of small exporters surveyed have operating facilities outside the U.S, and only 5 percent have employees outside the U.S. Meanwhile, just 5 percent rely on an export management company for help. 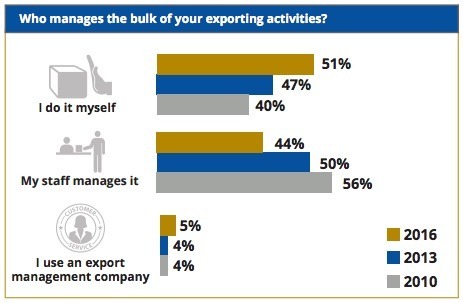 Fifty-one percent of small business owners say they manage the bulk of their exporting activities themselves, and 44 percent say their own staff manage it. SBEA reports that more small-business owners handle the bulk of their exporting activities today than at any point in the last six years. Still, more than one-third said they rely on freight forwarders, state and federal resources, and customs brokers to help them address the challenges of getting paid and complying with complex regulations. One-third of all small exporters said they had encountered difficulty exporting their products due to foreign import restrictions, and 75 percent are very or somewhat concerned about receiving payments from foreign customers. Most SMEs told SBEA that they utilize the Internet and wholesalers to sell their goods and services. And for marketing and establishing new trade markets, they rely most on online inquires, customer referrals, and trade shows. Getting the business in shape to export might seem like a daunting investment of time or money, but again, survey respondents indicate otherwise. Thirty-six percent of small exporters invested a few or several months preparing to export, and 7 percent spent a year or more. But 48 percent said they got their export business off the ground in a matter of week. And a majority of all small exporters said they devoted less than 5 percent of their annual operating revenue to getting ready to export. SBEA points to Small Business Development Centers, SBA export lending programs, U.S. Department of Commerce export programs as go-to resources for exporting help. For complete results, see the The 2016 Small Business Exporting Survey.